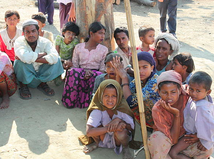 "Saddened by the suffering of Rohingiya people, which has been added to the suffering of so many other human being during the last few weeks, we, Buddhist and Muslim Leaders, associated with the Elijah Interfaith Institute, as well as leaders of other faith traditions, invoke the timeless aspiration of humankind for compassion and love, and yearning for guidance, succor, and help from supra-human realms so powerfully captured in the two prayers below—one from Buddhist sources and the second from the opening chapter of the Quran. We wish to recall this common teaching and high moral and spiritual yearning of the human soul at this point in time, especially in view of the suffering of the Rohingiya Muslims who are being persecuted and are suffering due to policies of a Buddhist majority state." nor despise any person whatsoever in any place. In the name of God -- the infinitely Compassionate and Merciful. Praise belongs to God, the Lord and Sustainer of all worlds, the Loving Nurturer, the All-Compassionate, the Possessor of the Day of Judgment. You alone we serve, and You we beseech: guide us along the path of uprightness, the path of those whom You bless, not the way of those who are overshadowed by anger, nor the path of those who wander without direction. May whatever political and group-identity needs that may need to be upheld never compromise the virtues of compassion, love and respect for the other; ... "
Click here to read the rest of the prayer.